Handcrafted Cerys Lambswool Navy Cardigan with a vertical hand intarsia stripe on sleeves in contrast colour block. A relaxed silhouette with a deep V-neck, the Cerys Cardigan has an effortless style with subtle pockets. Made in the Scottish Borders, Cerys navy melange cardigan is hand linked and finished in the local soft waters of the river Tweed. 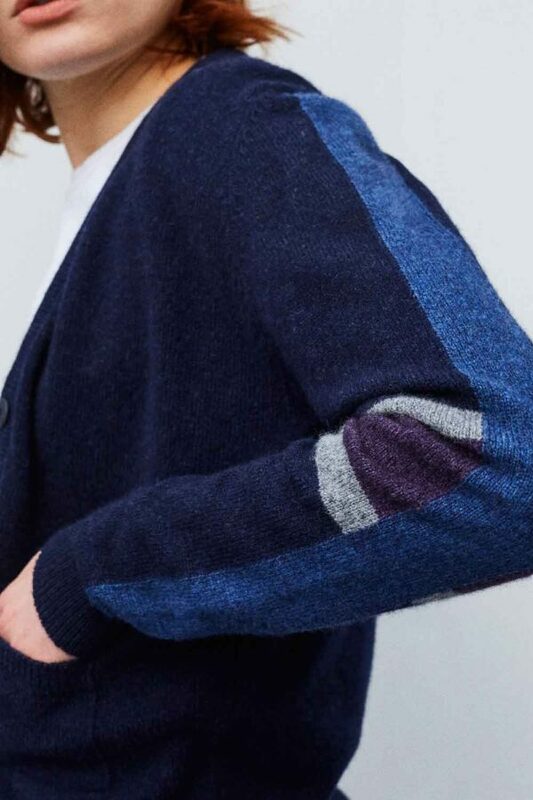 The Navy cardigan has a vertical stripe in Persian Blue, Elderberry purple, and mid-grey melange. Please note there is limited stock of the Cerys Cardigan.